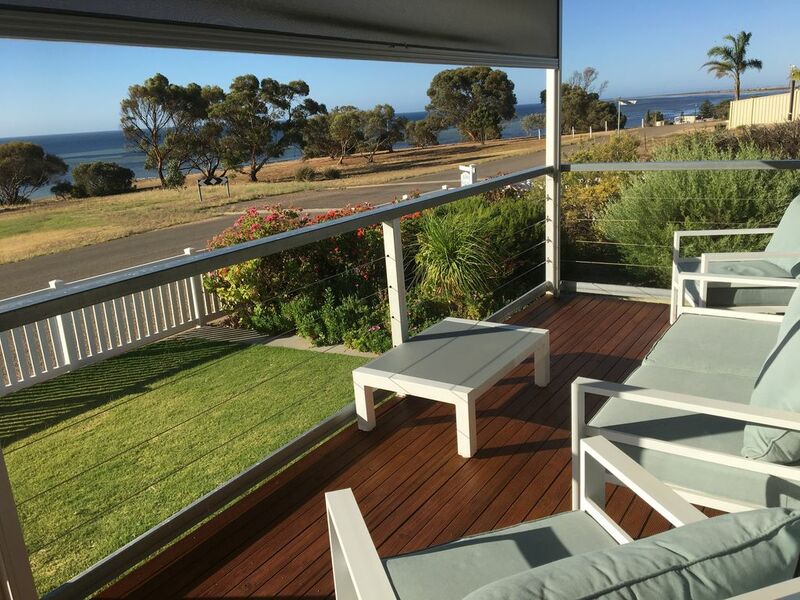 Bussy's Beach house is self contained waterfront accommodation approximately 15 minutes drive from Wallaroo & 20 minutes drive from Kadina, with beautiful uninterrupted views west across Spencer Gulf, it has 2 bedrooms, which can sleep 5. There is plenty of parking out the back & to the side, so you can bring your boat to take advantage of the fishing. Supplied is a nespresso coffee pod machine, dishwasher, BBQ, fully functional kitchen with basic pantry supplies. 2 TV's & DVD's, Wii with games. Linen supplied, beds made & ready to go, all you need to bring are your beach towels. Crab rakes & crab cooker are supplied and fish cleaning facilities too. Tickera is a quiet fishing/farming town, without a shop, so supplies need to be organised before, or you can drive the short distance (approx. 15 to 20 minutes) to Wallaroo or Kadina. The house is adjacent to a rough golf course, a walking trail infront along the foreshore is very relaxing. There is a historic well just around the corner, or just sit on the front veranda & read a book or look at the amazing sunsets across the water. There are 2 playgrounds within close walking distance, which children will love. The local community centre has delicious meals on the 1st Saturday of the month. (bookings essential). For a small fee we can supply a welcome basket of bread, free range eggs from happy chooks, locally smoked bacon, tomatoes, mushrooms, milk & butter ($30). Single nights will incur a $30 cleaning fee. Strictly no smoking inside & no pets. 2 seater couch, 2 single chairs. basic pantry items, honey, vegemite, peanut butter, sugar, tea bags, coffee & coffee pods, cooking oil. dining table is an extender table with 6 seats but there are more chairs in the back patio area. Some DVD's provided. A range of genres. Wii console, with some games. Front verandah has an outdoor setting that sits 4, 2 other chairs & 2 small tables. Back Patio where the BBQ is has a table with 6 chairs, out the back there is a small table with 2 chairs. This accommodation was perfect for us,seeking some peace in a tranquil setting. The beach house is well equipped, cosy and homely. The sea views from the verandah are magic. Stunning quiet little beach house Carolyn went above and beyond definately highly recommend. Peaceful get away in a very comfortable and well layed out beach house. This beach house had all the amenities we needed for a small family and was really comfortable and clean. Tickera was a quiet and peaceful spot and great view over looking the ocean from the deck. Loved staying here would definitely stay again. Great place, right on the beach, very small town which was exactly what we were after - to get away from it all! We had such a relaxing weekend, thank you for sharing your piece of paradise with us! Charming, neat, tidy and beautifully located property. Beautiful with everything you need. We only had a short stay but it was wonderful. The host, Carolyn was very responsive to our messages and really looked after us. Everything you need is there ready for use and it was all immaculately tidy. We loved the outdoor bbq area which is enclosed. I especially loved sitting on the porch with a glass (or two) in the evening. Unfortunately it was overcast for our stay so we weren't spoilt with a sunset, but I'm told they are well worth the look. The town is very quiet and there is the beach, walking trails and a small golf course to enjoy. This is a great place to spend a few days and I can't wait to go back again for a longer stay to really switch off and relax. I'll throw in a couple of golf clubs next time. Tickera is a very quiet town, with no shops only a community centre which is usually open on the 1st saturday of the month for a meal. The area is renown for blue swimmer crabs (in crab seasons) and yellow fin whiting can be caught off the beach. There is a short walking trail infront of our beach house, and an historic well just around the corner. Wallaroo & Kadina are only 15 minutes drive & Port Broughton & Moonta/Port Hughes are only 30 minutes drive. Kadina has a fantastic museum on local history of mining & farming to see at the Dry Land Farming centre which is well worth the visit.